The BVI Spring Regatta, hosted by Nanny Cay Marina and one of the BVI’s largest events, is in full swing. With 90 boats participating and over 18 countries represented, this fantastic festival of sailing is expected to contribute in the region of $5m to the BVI tourism sector. The weather is cooperating, with perfect winds for racing, records are being broken and spirits are high. On Tuesday, the course record for the Round Tortola Race was shattered ‘Fujin’—a Bieker 53 catamaran— winning the Nanny Cay Challenge with the fastest elapsed time of 1:57:16, shattering the 2015 2:33:40 record set by the trimaran Triple Jack. On Wednesday, the 3rd Annual Scrub Island Invitational enjoyed a record fleet of 42 yachts. Just 48 seconds separated first and second place with the J/122, El Ocaso, narrowly beating its sistership, Liquid, in the racing division. Thursday sees a much needed day of rest before the long weekend of more highly competitive racing and plenty of partying! 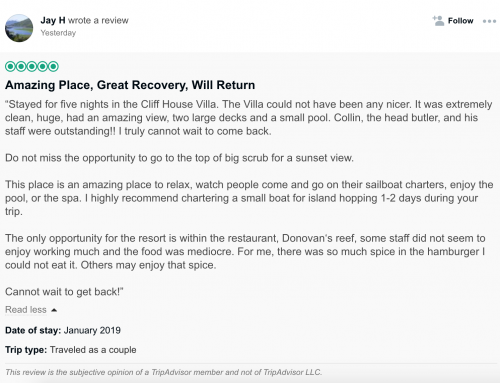 #ScrubIslandStrong – Great Scrub Island Review on Tripadvisor!